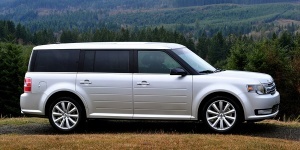 Substantially upgraded inside and out for 2013, the Ford Flex receives a revised V6 that comes standard on the SE and SEL trims. The interior receives a new and beautiful instrument cluster, steering wheel, seats and trim; and there's been a total revamp of the previously problematic MyFordTouch electronic controls. Find the used Ford Flex of your choice from a dealer in your area. Search our used car listings now.